Combine muddled strawberries, chilled simple syrup, and basil leave in shaker. Add lime juice if using, vodka (or gin & vodka) and ice, shake. 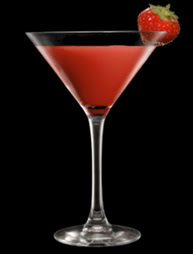 Tip into martini glass, garnish with a basil leaf and/or a strawberry, and enjoy!